Frank Bridge was 37 when the war began, and his enchanted world of pastoral beauty continued into his concert works, living in the shimmering countryside visions of Summer and the Edward Thomas/Ivor Gurney accented idylls of the Two Jefferies Poems. The String Quartet No. 2 of 1915 is also an example of a lyrical work written in the shadow of tragedy and inhumanity; there is surprisingly little angst in it. Again it will perhaps strike the listener as an escapist work once aware of its place in world history. More likely, however, its undulating lyrical lines will erase thoughts of war and loss. It has a great deal in common with the Howells Piano Quartet of the following year and Howells Phantasy String Quartet of 1918. The Cello Sonata, written between 1913 and 1917, is a work which acts as a bridge between the world of pastoral intoxicating innocence and the charred dreams and hauntings invoked by the Great War. There are two movements: Allegro ben moderato and Adagio ma non troppo - Molto allegro e agitato. An earnest and noble cello theme marches across the landscape to an accompaniment of glinting notes from the piano's highest register. It is all rather Brahmsian,but there is an unmistakable freshness as well and the textures are very rarely claustrophobic. The sonata was premiered by Felix Salmond and William Murdoch at London's Wigmore Hall. In David Apter's sleeve-note for the Marco Polo recording of the sonata (8.223637) he recounts a recollection of the cellist Antonia Butler (who gave the French premiere of the cello sonata in 1928). During the period 1915 until the completion of the sonata, Bridge was 'in utter despair over the futility of World War One and the state of the world and would walk round Kensington in the early hours of the morning unable to get any rest or sleep.' The rain-drop piano accompaniment about three minutes into the second movement is already hinting at the chilly accompanimental figures which were to come in Oration and Phantasm. The strange melodic turns of the cello also announces an emerging new direction concerned with disenchantment, and a tender, self-absorbed, uneasy crooning. The final movement is briefly vigorous but soon returns to the desolate mood of the middle movement. The piece ends conventionally and has a rather uncertain focus, perhaps because of its transitional nature. Bridge seems not to have had the compulsion to end the work in the resigned sorrowing spirit of the central movement and much of the finale. The abyss of the war years sucked in not only lives and limbs, but minds and reputations. Visions of bright pre-Raphaelite innocence burned in the blow-torch flame of a mechanised and slaughtering reality. Old confidences disappeared. A generation both amongst the (numerically fewer) aristocratic officer classes and among the urban and rural soldiery had been winnowed and decimated. The 'land fit for heroes' seemed sour to the returning forces, and the passing of the old order was accelerated. People returned with nightmare visions, and loss and bereavement was in the air. 'Soldiers from the war returning' would not talk about the things they had seen and the 'immemorial shames' they had committed and witnessed. Bridge was shaken and transformed by the trauma of the war and quite probably by an unreasoning guilt associated with the loss of many of his pupils, including Ernest Bristow Farrar (the dedicatee of the piano sonata). The cloud-hung works borne in the years of casualty lists, distant barrages, zeppelin raids and Remembrance Days appeared only slowly. Their creative impetus nagged steadily at Bridge, and matured and changed his world vision. The Great War blighted many artistic reputations; Bridge was one of these. Many composers were affected by the sea-change. Joseph Holbrooke's melodic, old-fashioned late-romantic music was on a high before the Great War but rapidly tracked downhill afterwards. Holbrooke's romantic language remained largely unchanged (although he did experiment with jazz dances). Bridge, however, changed. He changed, as far as we can tell, not for any cynical reason but because his creative mentality had been transformed. Bridge began to fall from popularity, not because he failed to change, but because of the direction of his change. He did not adopt the lighter approach. His music was not obviously jazz-influenced. Equally it was not fey and Celtic, although even this type of music was losing its hold,; phenomena such as the colossal success in 1922-25 of Boughton's Immortal Hour (which was actually written in 1912) owed more to escapism and spiritualism, then prevalent, than to any romantic revival. When, in the Immortal Hour, Dalua despairingly cries 'My Dreams. Give me my dreams!" many people in the audience identified with the despair. These dreams were linked surely to service-men killed at Jutland, Gallipoli or the Somme. In the same spirit, John Foulds's World Requiem was borne up for some years on a great tide of sentiment and sentimentality. Bliss's anthology symphony Morning Heroes (1930) - termed 'a symphony for orator, chorus and orchestra' - was an expression from the same territory, but though powerful it exalted heroism in a sentimental way; it did not have the salty ,dream-exorcising edge of the contemporaneous Oration. In Bridge's pastoral music, the leaf is beginning to wither on the bough and mildew settles on the landscape. The music has a pessimistic, downward curve; all of which was completely out of step with the British jazz era. Interestingly, however, his American connection, via Mrs Coolidge and three USA concert tours, was not impaired at all ,despite his increasingly expressionistic tendencies. However, the concerts he gave in the USA. featured his old-fashioned (The Sea) and pastoral works (Summer) which still had credence and acceptability there. Bridge's Third String Quartet (1926) is reckoned to be the first work in which he approached the Second Viennese School style with utter commitment; not that there is any suggestion that this was a question of aping a school he admired. This mode of expression suited the composer, who emerged from the alembic of war and loss; bereavement of success, and of friends and pupils. The work is decidedly thorny and requires persistence to enter its world. A more approachable work but still in an advanced idiom dates from 1928. This is the Rhapsody Trio for two violins and viola. It was not published until 25 years after Bridge's death. There are far more echoes of Enter Spring in this work than in the earlier Third Quartet. It is also far more accessibly lyrical. The Third Quartet's lyricism is tough to make out. The Trio, on the other hand, is very approachable without being at all bland, and sports many qualities including an elfin-haunted beauty which we also find in the Ophelia study: There is a Willow. This is a fine Trio ,which defies the drab image that string trios often attract, and is to be highly recommended. 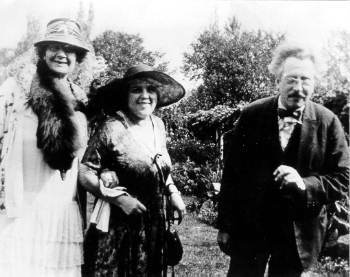 Bridge met his patroness Mrs Elizabeth Sprague Coolidge, a generous patron of the chamber music arts, on 28 May 1922 at a party given by Mrs Winthrop Rogers, wife of a music publisher. The Bridges and Mrs Coolidge began a close friendship which lasted until Bridge's death. In July 1922 Frank, Ethel, Mrs Rogers, and Mrs Coolidge together took a motoring tour of France. In 1923 they enjoyed a holiday to Belgium and Holland. In autumn of the same year Bridge made the first of five visits and concert tours of the USA. Mrs Coolidge, a capable pianist who also composed, was heir to a substantial fortune from the Chicago pork-canning business. She used her fortune to support chamber music and various composers, such as Casella and Respighi. Eventually she established a Trust Fund which was to support the Bridge family from the late 1920s onwards. Mrs Coolidge was known affectionately to the Bridge couple as 'Souzanne' and she called him TWO-ZEE. She founded the Berkshire Festival, with an emphasis was on modern chamber music, at her home in Pittsfield, Massachusetts; it ran from 1918. She invited leading composers and musicians from all over the world, all at her own expense. The Festival featured prizes and composition competitions. In 1924 her donation funded the construction of the concert hall at the Library of Congress, and income from her trust funds maintained annual chamber music concerts there. Her munificence also supported festivals in Europe. Mrs Coolidge became as important to Bridge as Lord Howard de Walden did to Joseph Holbrooke. She initially had trouble getting Bridge to accept this new financial security. However, she knew that the increasing teaching workload which he was having to take on was halting his compositional activity and condemning him to a grey-haired existence. Bridge was unstinting in his response to her generosity. The string quartets 3 and 4, the second piano trio and the second violin sonata were all written for her. The Brosa, Roth and Pro Arte quartets all played the third quartet, in Siena, Brussels, London and Paris. Bridge glowed under her attention and support and even considered settling in the USA. He might well have secured a ready audience for his more radical works had he made this move but it is doubtful that he would have written Enter Spring, Phantasm and Oration without the inspiration of the Friston littoral. He realised that he needed an English locale in which to write the very music which Mrs Coolidge's patronage allowed him to write. Rather like certain insects and animals which can only flourish in a particular area, Bridge knew that he must live in Sussex and specifically at Friston if he was to give of his best. From the end of the war to the end of the 1930s, Bridge gradually pitched into a world of night music, sour fanfares, Gehennas of the psyche, despairing dreams, bitterly grim marches and negation. There was nothing of the trivial 'Twaddling Twenties' about this music! This was a strange situation. Friston was to be his 'homeland' and yet the happiness of his time there bore not only the joyous nature celebration of Enter Spring, but also the dark nocturnes of the soul associated with Oration and Phantasm. There is a Willow Grows Aslant a Brook of 1926 is reflective. It is as if Bridge had been influenced by Bernard van Dieren's music, or Goossens' more astringent efforts. As Peter Pirie has written, the music of this later period from 1925 onwards developed: "a haunted, dark aspect, the counterpart to those attributes of nature in our islands that are evoked by owls, enchanters' nightshade and moths, a loveliness mingled with unease. A decided harmonic stringency began to be felt, and an increasing mastery, while the salon influences slowly vanished. Bridge's technique was so finished that few composers were his equal for easy mastery of his materials;" There is a Willow is an orchestral sketch describing the Death of Ophelia in an uncertain harmonic language which might have stepped out of the pages of Van Dieren's Chinese Symphony (1914) or Zemlinsky's Lyric Symphony. Although Bridge was based in London he spent much time in his native Sussex. The Bridges had a close friend in the artist Marjorie Fass, who lived in rural Sussex. They holidayed at Marjorie's Friston cottage, which is on the Downs between Seaford and Eastbourne. The Downs and the sea cast their spell over Bridge and it was decided to move back to Sussex. During the mid-1920s they built a house called 'Friston Field' with a prospect over the Downs. The house site was located looking towards West Dean and Friston Forest. Such was the spell cast by this house, the Downs and the marine-scape that Bridge was moved to write a masterful nature poem which he at first called 'On Friston Down' but shortly retitled Enter Spring. Friston Field and its landscape was the true begetter of this dynamic celebration of countryside. The masterly rhapsody Enter Spring was amongst the last flowerings of a vivid pastoralism tempered with the serious stirrings of his more avant-garde style. It is a synthesis of the style of the Two Jefferies Poems and There is a Willow Grows Aslant a Brook. With Enter Spring's echoes of Ravel and Stravinsky's Rite of Spring, the music is complex but deeply tuneful. Perhaps Bridge knew something of Bax's symphony Spring Fire, with which Enter Spring shares a similar atmosphere, although the Bax work dated from some fifteen years earlier. Interestingly, the Bax work was planned to be premiered at the 1912 Norwich Festival which was later to be the scene of Bridge's 1920s triumphs, including the premiere of Enter Spring. Enter Spring's twenty minute span has an infectious and intoxicating swing, and a power which almost invokes the violence of the Russian spring. If he had called it a symphony it would have been hailed as a counterpart to Sibelius's one movement seventh. The work is still desperately undervalued on the international stage. Its combination of raw nature painting and his later sparer style is uniquely powerful. Enter Spring may refer to a season of the year, but its unstoppable march of Nature has more in common with The Rite of Spring and the wildness of John Foulds's April-England than with the dazzling portrait painting of Glazunov's Seasons or even Bridge's own Summer. Friston and the South Downs, with their brisk atmosphere, sea-cliffs, storms, and gulls proved remarkably fruitful for Bridge. There he wrote Oration, Phantasm, piano trio No 2, Rebus, the second violin sonata, and the last two string quartets. The Piano Trio No 2 (1929) is one of his thornier works, though more impressive and somehow lighter in texture and more accessible than the third string quartet. It is a step onwards from the piano sonata completed in 1924. The trio is counted by Anthony Payne as one of the masterpieces of 'twentieth century English music, indeed European chamber music.' Its whispy charms are of the finest feathery material and treatment. Lyrical material is very rarely fully stated, instead it is hinted at. Towards the end of the first movement Bridge, however, unleashes a fine typical melody which is fully stated. At the end of the second movement another fine theme emerges and is beautifully floated. This music reminds me of the string quartets of Franz Schmidt. The impressive trio can still be difficult listening. While this work perhaps does not have the gripping power of Oration or Phantasm, it is likely to yield up rewards from repeated listening. If Bridge is remembered by a wider audience it is often not because of his own music but because of his tutelage of Benjamin Britten. At the age of ten, Britten first encountered the music of Frank Bridge. Britten attended the 1924 Norwich Triennial Festival and heard Bridge conduct his suite The Sea: "He was knocked sideways." The influence of this bright orchestral work in Bridge's innocent style can be heard in Britten's Sea Interludes. Britten was not the only one impressed. The Norwich Triennial's committee promptly commissioned a new orchestral work from him and were rewarded with Enter Spring, one of Bridge's masterworks . In 1927 Bridge's impact was further affirmed by the première of Enter Spring, at Norwich, conducted by the composer. However, his friends at Norwich did not sustain their interest in 1930 or 1933, when Oration and Phantasm might have been presented. In 1928, Britten began regular lessons with Bridge, who took the young composer under his wing and went to concerts with him, generally directing his growth and development. There was no mollycoddling. Bridge had no other pupils and he treated the callow Britten as if he were an adult. Bridge's influence also extended to his attitude to war, and Britten's pacifism can be traced back to these days. Britten, writing of Bridge's strictness and loathing for amateur standards and sloppiness, said he insisted "on the absolutely clear relationship of what was in my mind to what was on the paper. I used to get sent to the other side of the room. Bridge would play what I had written and demand if it was what I really meant." While Bridge was strict he was also a compassionate and thoughtful friend. When the premiere of Britten's lively and dramatic song-cycle, Our Hunting Fathers, was given the Norwich Festival the reception was less than warm. Britten was bitterly disappointed. Bridge wrote to Britten on 3 May 1937 consoling him and pointing out that many a fine work now an orchestral staple had begun life with an indifferent or disastrous first performance. Britten also offers insights into Bridge's home. Here he heard the latest poetry. Conversation ranged over music, art, literature and sculpture. He drove the young composer around the South Downs, opening his eyes to the beauty of landscape and buildings. The cardinal principles Bridge set about inculcating were to find yourself, remain true to that self , and through the use of good technique to express with scrupulous attention and clarity exactly what was in your mind. Peter Pirie has remarked on the influence of Bridge's music on that of Britten. Rarely, however, was Britten able to capture the vivacious magic of Bridge's best music. Pirie noted that the Cello Symphony was shaped in part by Phantasm and that Enter Spring can be heard in the fanfare and timpani passages towards the end of the work. The departure of Britten and Pears (who later together recorded songs by Bridge) to the USA must have left the already ill Bridge wondering about his decision in the 1920s to stay in England. Britten was Bridge's most celebrated pupil. The two, composer and singer, were not to return from the USA until 1942. Bridge died in 1941.